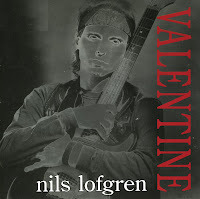 Nils Lofgren released his first album with Rykodisc in 1991. It was titled 'Silver lining' and featured the single 'Valentine'. The track featured Bruce Springsteen on backing vocals. For most artists, this is quite a feat, but Nils Lofgren had already been in Springsteen's E-Street band for almost a decade. The arrangement must have been really easy. It meant a hit for Lofgren, at least in the Dutch Top 40 where the single reached number 16. The single did not chart in the UK. Nils Lofgren was born on June 21, 1951 in Chicago, Illinois (USA). He joined Neil Young's band, following this up with a brief stint with Crazy Horse in 1971. His own band Grin then landed a record deal and had some success for three years. Lofgren then launched a solo career. 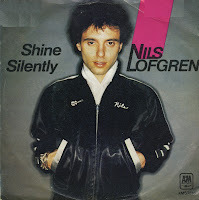 His fifth album 'Nils' was released in 1979, featuring the single 'Shine silently'. This single reached number 21 in the Dutch Top 40 in the autumn of 1979 and is still a firm radio favourite these days.